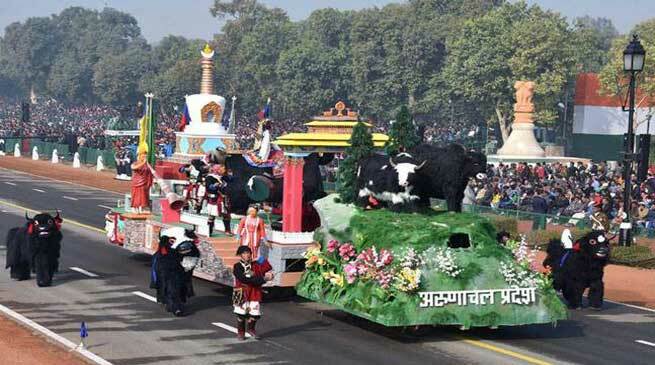 The Arunachal Pradesh Tableau team who presented YAK DANCE on the occasion of 68 Republic Day at Rajpath New Delhi bagged the first prize as best tableau beating all 23 tableaux who took part in this year’s parade. It depicted the Yak dance, one of the most famous pantomimes of the Mahayana sect of Buddhist tribes of Arunachal Pradesh. Tripura’s tableau based on ‘Hojagiri’ dance, depicting the magnificent Reang tribal dance was adjudged the second best, while the third position was shared by Maharashtra and Tamil Nadu. The team received the award from Union MoS Defense Dr Subhash Ramrao Bhamre at a glittering function held on Saturday at New Delhi. Altogether, Seventeen States/Union Territories and six Ministries paraded their tableau during the Republic Day Celebration 2017 at Rajpath, New Delhi on 26th January, 2017. Read this also- Story Behind the conceptualisation and designing of Arunachal Pradesh Tableau for Republic Day Celebration 2017. Performing Artists were all from Tawang and are: 1. Shri Genden Tsering 2. Shri Dorjee Tsering 3. Shri Wangchu Monpa 4. Shri Tashi Tsering 5. Tashi Namgey 6. Shri Koncho Tsering 7. Shri Lobsang Dawa 8. Shri Karma Thinley 9. Shri Nawang Dorjee 10. Choibey 11. Shri Rhinder Norbu 12. Shri Tashi Dorjee 13. Shri Temrin Tsering 14. Shri Thupten Chombey 15. Shri Dorjee Ngurup 16. Shri Tenzin Samphel 17. Shri Lobsang Delay 18. Shri Tsewang Gyatso 19. Shri Lamu Wangda 20. Shri Thutan Tashi. Director IPR Obang Tayeng said that this is a matter of great joy not only for the members of the cultural troupe from Tawang but also our IPR Art and Exhibition team and officers. A lot of brainstorming, research work, planning , design work, model preparation and practice had gone into the grand outcome. This is the outcome of our collective effort and hard work. Congratulation to all team members and IPR departmental team, he added.